Gelato is one of the best desserts to finish off a delicious meal. This sweet, Italian ice cream is dense and delectable, and served up authentically in Maryland. This cool, refreshing dessert can become your favorite if you find the right spot to get it and here are our nine favorites! The Italian Market is a destination in and of itself. Here you can find Italian meats and cheeses like you would at a traditional Italian butcher shop. Plus, for dessert, you can treat yourself to fresh and fantastic gelato. It is full of flavor and the entire market/restaurant is highly traditional. You can come here to shop, eat lunch, have dessert and leave incredibly satisfied. Located near the water taxi stop, Pitango is a favorite summertime destination in B-Town. They only use milk produced by grass-fed cows and their gelato is entirely organic. Even their flavoring is all natural, using real berries and chocolate instead of the artificial stuff. Their gelato is clean, healthy and absolutely delicious. You can taste the difference that farm fresh ingredients make. Incredible taste and unique flavors define Firenzes. A newer addition to Annapolis, they are located in the Market House and a popular destination for both tourists and locals looking for something cold but different from traditional ice cream. Melt is a destination throughout the year because their gelato is so delicious. Made using fresh ingredients and precision, this is where locals come to cool off and taste a fabulous dessert when looking for something outside the box and tasty. Farm fresh, local ingredients are combined to create this organic and tasty gelato. Some of their flavors include Thai coconut milk, black sesame, Vietnamese cinnamon, rye whiskey pecan praline, and King Leo peppermint. These are just a few of the incredible flavors that they feature and change on a regular basis. Nothing like traditional ice cream, you are sure to enjoy it. This café is an excellent place for breakfast, lunch or a casual dinner. Using fresh ingredients, they create interesting dishes and the atmosphere promotes savoring them. For dessert, you can try their homemade gelato in a variety of flavors. They even offer free samples to help you choose. Whether you want fresh gelato or a hot cup of coffee, the Kefa Café is where you want to go to unwind and relax with friends. The cool, casual and friendly vibe of the place makes it possible to stay for a while and truly kick back. It’s been a local favorite for years and with good reason. Bring your laptop or a good book, meet up with friends or study all afternoon. You can do this and more at Zed’s Café without feeling rushed. 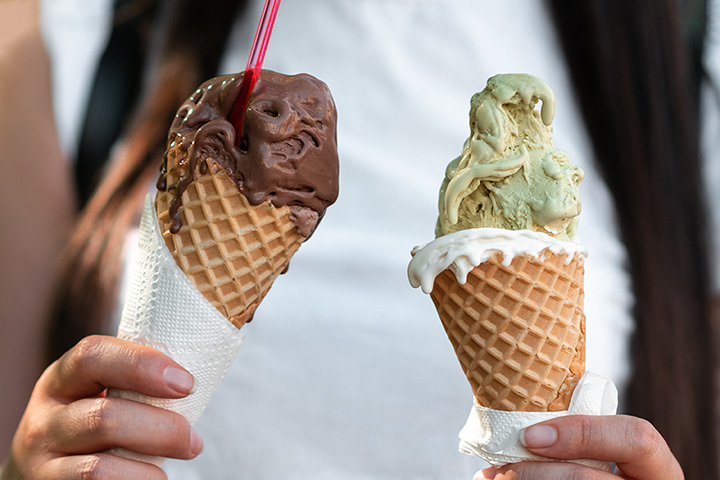 Since you can stay for hours, be sure to end your trip with a large gelato.